One of my childhood friends is having a baby!!! Even though I’m 30, when I look at my friends and I, I still see us as little kids running around playing tag and hide and seek. It’s hard to believe that we’re not children anymore. When my friend mentioned a baby gender reveal party, of course I didn’t hesitate when she asked me to make a cake. I love making cakes for friends and family. I can’t help but feel honored when asked to help celebrate birthdays and special occasions. Just DON’T EVER ask me to make your wedding cake. I’ve worked at bakeries making wedding cakes/macarons/petits fours and I NEVER, ever, EVER want to deal with brides again. I’ll happily make you an anniversary cake/I just quit my job cake/I’m sad and I need cake cake, but I don’t want to be responsible for dessert at your wedding. 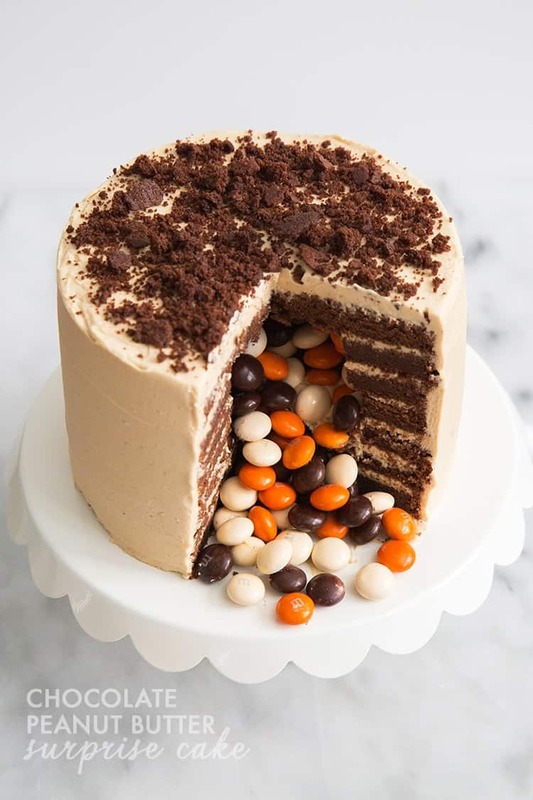 Anyway, I’ve seen lots of different variations on these M&M surprise cakes on the internet. Although my friend’s party isn’t for a couple of weeks, I like to be prepared. I never make a cake without testing it out first. Plus, Alex has been badgering me for another chocolate peanut butter dessert. I used the chocolate cake and peanut butter frosting from Alex’s baseball cap birthday cake. 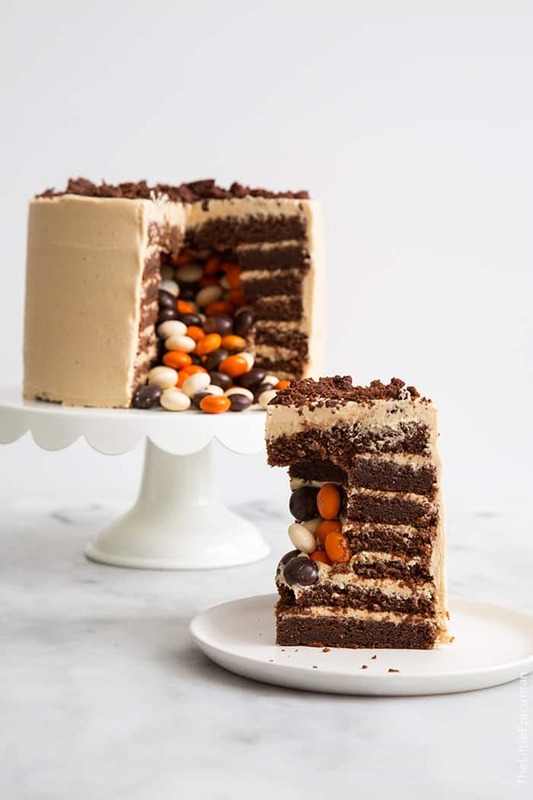 Use two of the reserved cake layers for the bottom of the cake. It’s best to two layers so you have a strong base. Stack the cut layers on top. Frost and assemble cake as normal. Fill the cavity with candies of your choice. Place remaining reserved cake layer on top. Coat and frost cake as usual. I used these pumpkin spice latte M&M’s. I used the remaining cake round to make oven dried cake crumbs as shown above. They’re like little crunchy cookie bits. Simply crumble the cake into small chunks and bake them in a 350 degree F oven until they are nice and crispy. They add a nice change of texture to an otherwise soft dessert. While these cakes are really fun and exciting to cut into, keep in that this cake doesn’t serve a lot of people. You’ll end with oddly shaped slices. (Delicious! but oddly shaped) These cakes are perfect for special occasions like baby gender reveal parties and engagements. They’re also great for candy lovers. 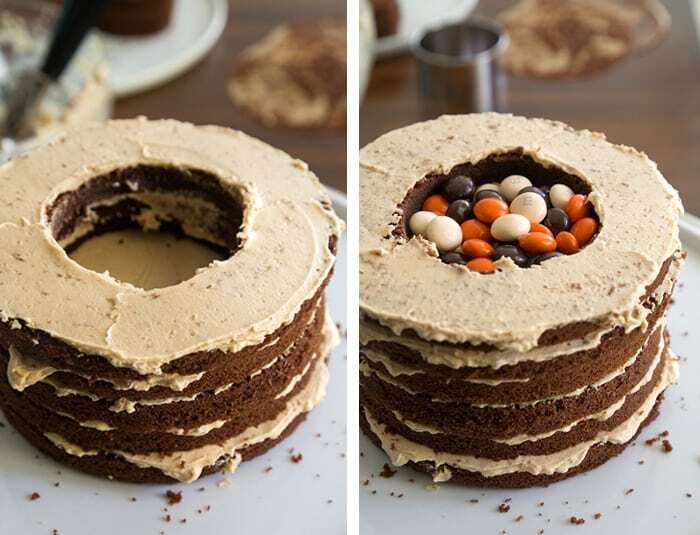 Think about it… you could fill this cake with gummy worms, Reese’s pieces, Rolos, sour candies, etc. Preheat oven to 350 degrees F. Butter and lightly flour four 6- inch cake rounds (3-inch deep). Line with parchment paper and set aside. In a medium bowl, whisk together flour, baking soda, salt, cocoa powder, and espresso powder. Make sure there are no cocoa powder lumps. If desired, sift ingredients together. Set aside. In the bowl of a stand mixer fitted with a paddle attachment, cream butter until smooth. Gradually add sugar and beat until lightened in color and fluffy in texture. Scrape down bowl as necessary. Add eggs one at a time, ensuring each egg is incorporated before adding the next one. Scrape bowl as necessary to ensure even mixing. Add 1/3 of dry flour mixture to mixing bowl. Mix on low speed until almost combined. Follow with 1/2 of milk mixture. Repeat and end with last 1/3 of flour mixture. Mix until thoroughly combined and there are no streaks of flour left. Divide batter evenly between four 8-inch cake rounds. 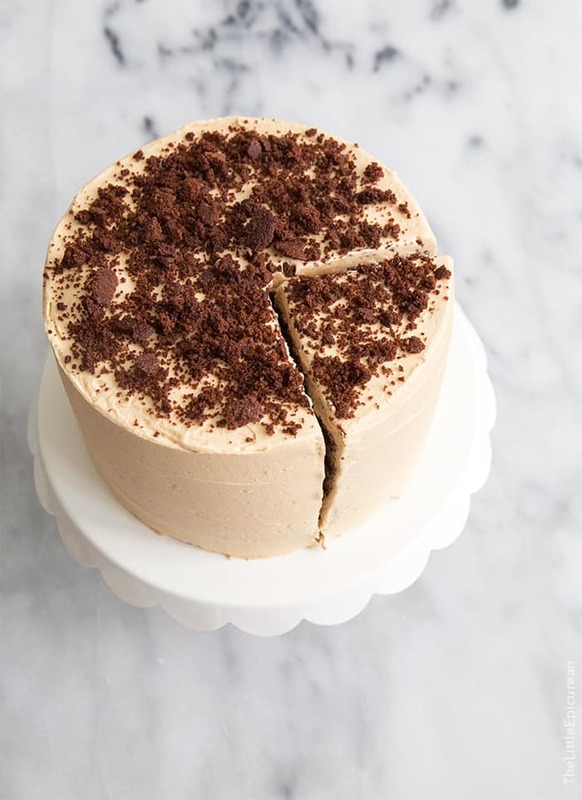 (If you only have two cake rounds, divide by two and split cake layers after baking.) Use a mini offset spatula to even out the cake batter. Bake for 25-30 minutes until cakes are done and toothpick inserted in center of cake comes out clean. Let cakes cool for 5-10 minutes before unmolding. Let cake cool to room temperature on wire rack. In the bowl of a stand mixer fitted with a paddle attachment, beat together butter and peanut butter until smooth and combined. Slowly add sifted powdered sugar and mix on low speed until incorporated. Add cream and mix until desired consistency is achieved. 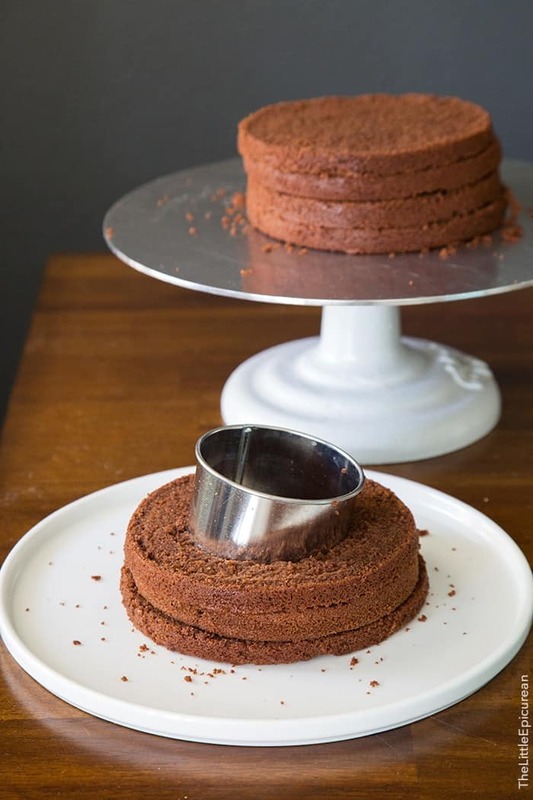 Use two of the reserved cake layers to serve as the bottom of the cake. Frost and stack cake as normal using the cut cake layers. Fill the cavity with candies of your choice. Place the remaining reserved layer on top. Coat and frost cake as usual. If desired, use the unused cake round to make "dried cake crumbs." Crumble cake into small chunks. Bake in a 350 degree F oven until cake crumbs are dried and crispy. that’s gorgeous! i love the colors (though i do have to ask, how are the pumpkin m&ms with the chocolate and pb??). and this one seems so reasonable (time and effort wise) for a “surprise” cake, without compromising anything! Good lord girl, that is one awesomely adorable surprise! 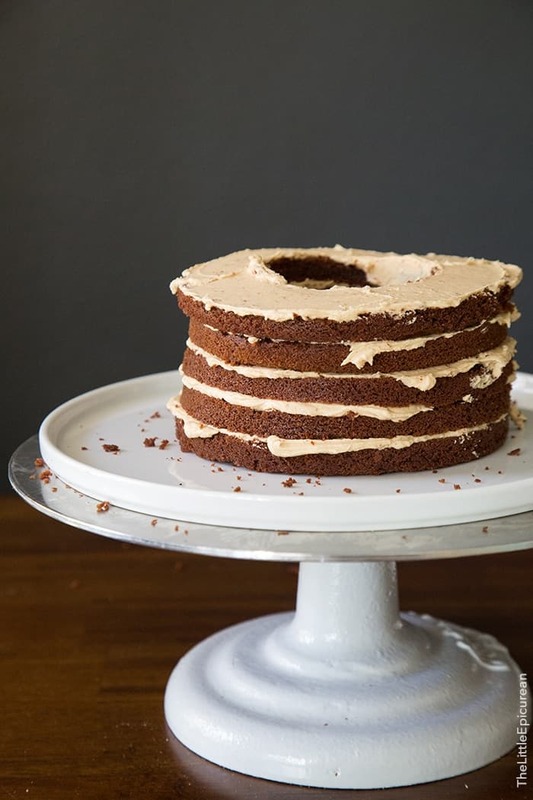 Love everything about this … the surprise, layers and that yummy frosting. LOVE. My menagerie would go gaga over this! Crazy adorable cake!! I’m in LOVE! I LOVE this cake, it’s such a fun idea! I would have never thought of it but I can see how it would be a huge hit at parties. What a cool idea! 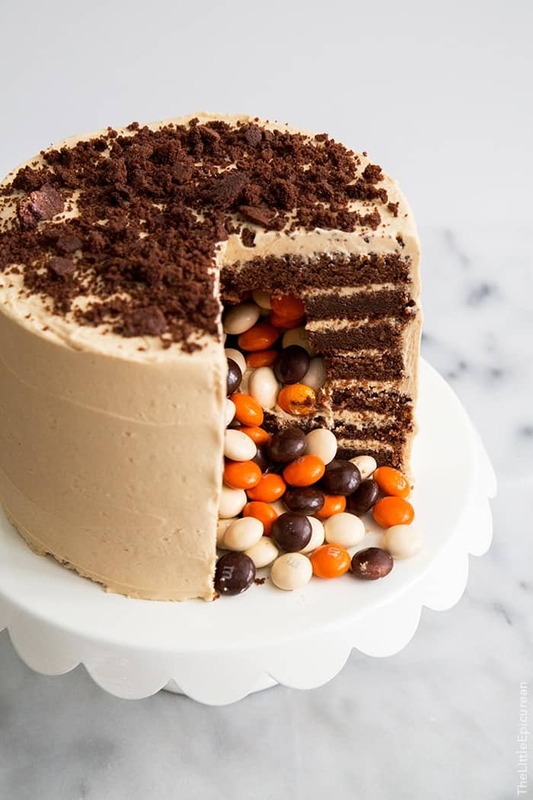 I love this concept of filing the cake with candies, such a nice surprise :P The chocolate + peanut butter flavor sounds delicious too! This cake looks fabulous Maryanne! What an awesome idea to make for a gender reveal party! This looks delicious! I am a fan of chocolate cake any way it comes. I’d love a surprise like that cutting into a cake! This is just the coolest! Thanks for the tutorial, so much fun and so festive for the fall season!